What can i say - it was my birthday and he was the best lookin fella around! 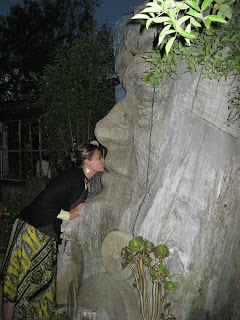 Turning 27 in New Zealand with my best friend and couple of bottles of red wine - left for an interesting evening when we walked through a sculpture park outside Abel Tasman National Park on the way back to our camp site. After a 5 hour hike back from a boat drop off in the middle of the national park, we celebrated the evening by getting frocked up and dining in style.